Yesterday the forecast predicted imminent hibernation (windchills today of -30) so I set off for the woods while I still could. I like this park because it gives you immediate gratification. The trails for the most part go up and over the many ridges, rather than along their spines. So if you go up a hill, you go down a hill. It was still cloudy when I started out. By the time I was done the skies were blue and the hard cold air had arrived. As I skied, the wind thundered through the treetops. This blocked out the distant sound of the highway that I can usually hear anywhere in the park. A week ago, skiing here would have been impossible, it was nothing but ice. 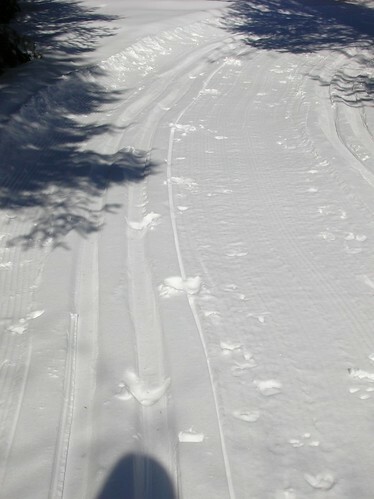 This day, the trails had still not seen a groomer, but a few inches of fresh snow was enough to make them passable. This is the park where I skied four times a week when I was on the ski team in junior high and high school. 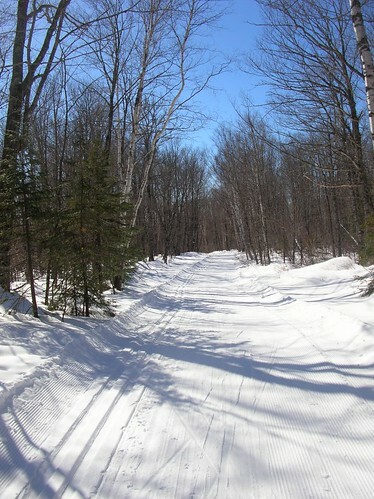 It is 284 acres of hilly hardwoods with the trails packed tightly in so that you can ski and ski, deciding at every intersection which way to go, knowing that you’ll be presented with another option just around the next bend. You just have to commit, that’s the secret as much as there is one. To paraphrase Alan Sparhawk in Cross Country with the Snakes, you gotta put your foot down, just like when you’re on stage. You gotta put your foot down and mean it. There’s a powerline that runs through the middle of the park and it is a big wide cut. It separates the front from the back. The time it takes to get there is about the time required for the mind and body to settle down. In that back half of the park, that’s where you find things. Things like the rhythm of skiing. Poles crunch into the snow, skier strides, skis glide, so on. You start to see that that it is not unto itself, but just another pattern in nature. But there isn’t anything ahead or behind, just the snow under your skis. 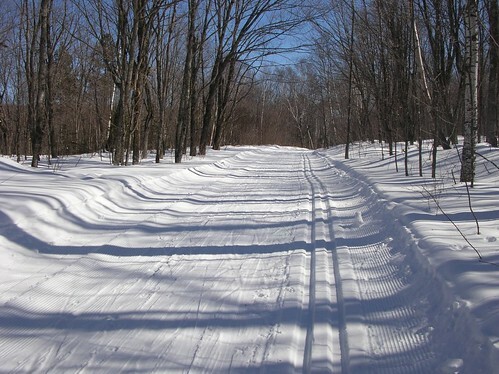 This entry was posted in life and tagged cross-country skiing, winter on Sunday, February 10, 2008 by Greg. I coast across the trail intersection to look at the map mounted on posts on the other side. When I stop, I hear nothing except the pounding of my heart. The distant whine of snowmobiles that had periodically reached my ears while skiing the last kilometer from the trailhead are absent now. So is the soft clatter and crunch of my skis against the snow. The leafless woods are perfectly still and silent. Then a crow squawks from some distance off, calling three times, then pausing, then three more times, then pausing again, and then a final three times. Then all is quiet again and I am left with the feeling that the crow’s caws were of a rhythm very similar to that of my heartbeat. It was late on Saturday afternoon and I was squeezing in a couple hours of solo skiing before heading back to the lodge where Rosie and 12 of her family would be waiting. We had rendezvoused at Lutsen the previous night for a winter weekend on the North Shore. Some had spent the day downhill skiing, others at a cooking class at the Folk School in Grand Marais. Her uncle Dan opted to wood carve at the condo and her dad had taken cousin Lori and her little Julia for a brief snowshoe hike in the morning and was surely now enjoying the resort’s hot tub. Rosie and I and her cousin Scrubs and her husband (and my good friend since the third grade) Wrench had come north on Thursday night. In Duluth, we got together with Sam and his girl Sarah and headed down to Fitger’s Brewhouse, hoping to catch Alan Sparhawk‘s Los Besos at their regular Thursday gig. The Besos didn’t show, but we still had a fine time socializing and sampling pitchers of the Brewhouse’s beers. Sam was gracious enough to give over his apartment to us for the night and the four of us slept in one room, reminiscent of slumber parties none of us had partaken in for many years. We woke late and moved slowly, finally getting to Amazing Grace in Canal Park for breakfast late in the morning. Not long into breakfast, Wrench pointed out that the cafe must have been serving some potent coffee, as the pace and energy of our conversation had picked up noticeably. It was at Amazing Grace that Katie’s brother Brian and his fiancee Ruthann joined us after driving up from the Twin Cities that morning. After breakfast, we headed up the shore in a caravan and got to Sawtooth Outfitters in Tofte mid-afternoon. 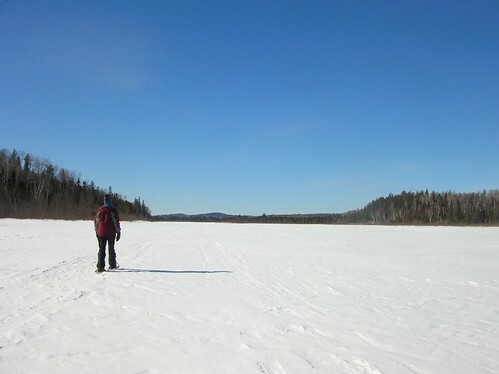 There, we rented snowshoes from the friendly proprietors and got a recommendation to check out the Onion River. We checked in to the condo, quickly changed into suitable attire, and headed out for a little adventure. In case you’re curious, the snowshoe trail on the Onion River is not anywhere near the Onion River Road intersection with Highway 61. Being ignorant of that fact, and to the amusement of several snowmobilers who happened to pass by and park at said intersection as we strapped on our snowshoes and went in search of the river, we spent a bit of time on the wrong snow. But we had a fun little trip down to the lake, slipping down through pines and cedars, over rocks and embankments, ending up on the icy shores as the water lapped its eternal waves against the rocks. We turned around and went back up the hill and back to the cars, which we loaded into again and shortly found the wayside we were seeking just a couple more miles down the highway. 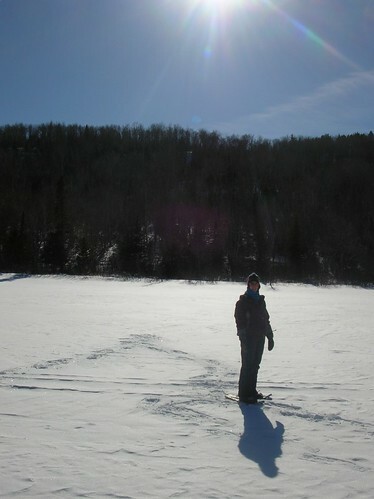 There, we strapped the snowshoes back on and headed up the river. On the river. It was a new experience to me, but something I had been wanting to try for a while. Just last month, Stephen Regenold had an article in the DNR‘s Conservation Volunteer magazine about “rivering” on the Onion, where he actually skied down the river. So here I found our motley crew. The ice on the river was generally a foot or two thick, with occasional spots where it was barely there at all and the water could be seen flowing underneath. 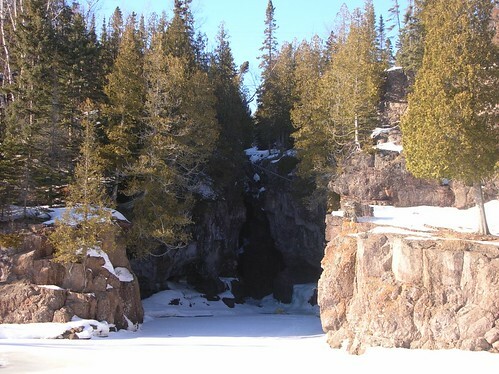 But, by following the well-packed snowshoe trail, we were able to access the river gorge that must be nearly inaccessible at almost any other time of the year. We hiked beneath looming red cliffs up the twisting stream, finally arriving at the foot of a 30 or 40 foot waterfall, which was frozen solid. We picked our way up a narrow trail alongside the falls, then were soon at the foot of another that we didn’t care to ascend. We stood at the bottom and admired it, noting a thin spot in the ice where the falling water could be seen behind it, eerily silent. In the failing light of the afternoon, we turned back and headed downriver again. In the morning, Rosie and I and our soon-to-be sister-in-law Ruthie started out our day with Lutsen Mountain‘s “norpine” skiing, wherein the skier takes a chairlift to some summit and then gradually descends a four kilometer trail. It had been my idea, but I was disappointed in its realization. Only one trail was open and it was poorly groomed and not terribly exciting. 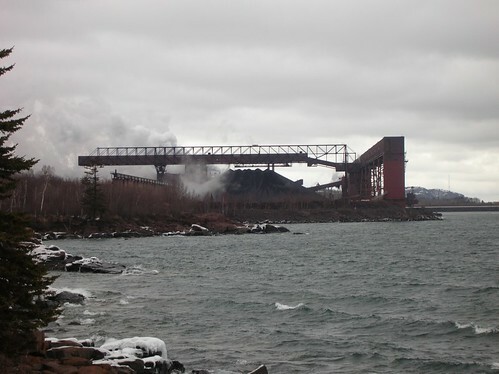 Perhaps my opinion was based on knowledge of just how fantastic the Sugarbush trail system was — just eight miles away near Tofte. I hadn’t been able to find anyone who had skied Lutsen’s trails before we headed north, so to anyone who might consider it, I’ll say it seemed like they only offered the cross-country trails as a last resort for those who got dragged along to the ski resort but refused to downhill. Just my opinion and experience, anyway. So, after meeting up with much of the group for lunch slopeside, Rosie had heard the siren call of the hot tub and Ruthie decided to ski up the trail we had just come down to actually get a workout. Leaving me to my devices. Which brought me to that lonely intersection in the Sawtooth Mountains. After soaking in the silence a minute more, I found myself on the map and determined which path was mine. It took me to the crest of a long hill that cut straight down through the woods. I pulled my hat down over my ears, pushed off with my poles, got into a tuck and reveled in the wind on my face and the crescendo of the whine and buzz of my skis in the tracks. It was only the wind, but tears came to my eyes anyway. 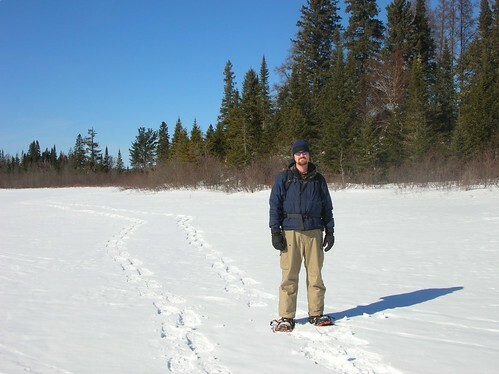 This entry was posted in life and tagged cross-country skiing, north shore, winter on Monday, February 04, 2008 by Greg. 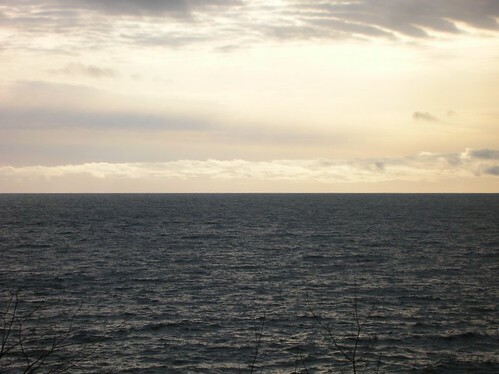 We just took a four day vacation to Minnesota’s North Shore, staring at the awesome expanses of Lake Superior, skiing, snowshoeing, reading, sleeping, eating and doing nothing at all. 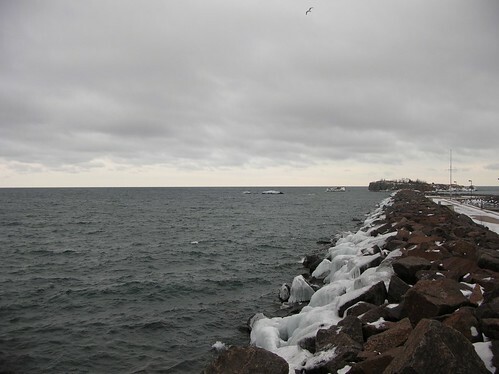 Aside from playing outdoors and relaxing indoors, we also visited some old friends of my parents who have found a wonderful place for their retirement in Grand Marais. And we saw a singer-songwriter who I used to be friends with in high school but who I haven’t seen in several years, during which time she has done quite well in the past year or two. There’s a good chance those two facts are related. Or possibly it’s just that she has it all: an amazing voice, a talent for songwriting, great confidence on stage, and passion. She put on a wonderful show Friday night in Grand Marais. I don’t have a lot more to say about the vacation, but we did snap a few photos that I thought were worth sharing. On a river in the Superior National Forest off the Gunflint Trail. 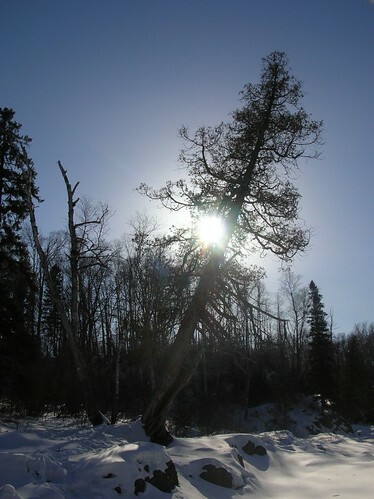 At Temperance River State Park. Driving through Deb‘s neck of the woods on the way home. 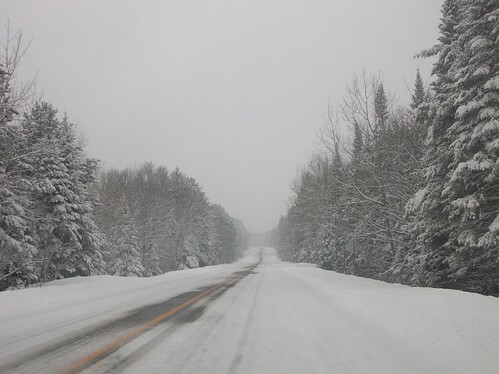 It was a real snowstorm by our standards and it was a lot of fun to drive along barely-plowed roads on a quiet Sunday afternoon with the pine trees blanketed in snow. Bottom line: after a non-winter in the Twin Cities, it was good to spend a few day somewhere with snow and everything that winter should be. It was far too brief a time spent up there and we both realized even more how much we love the north country of Minnesota. This entry was posted in life and tagged cross-country skiing, north shore, snowshoeing, winter on Monday, March 06, 2006 by Greg.